The Artist in Residence Program at Recology San Francisco will host an exhibition and reception for current artists-in-residence Yulia Pinkusevich, Stephanie Syjuco, and student artist Brittany Watkins on Friday, January 24, from 5-9pm and Saturday, January 25, from 1-3pm. Additional viewing hours will be held on Tuesday, January 28, from 5-7pm. An artist panel discussion will follow at 7pm at 401 Tunnel Avenue. This exhibition will be the culmination of four months of work by the artists who have scavenged materials from the dump to make art and promote recycling and reuse. An important part of Yulia Pinkusevich’s practice involves the creation of large-scale monochromic paintings and drawings, often made directly on walls that engage with architecture and play with spatial perception. While at Recology she has continued this practice, but has also “drawn” with the duality of light and shadow, constructing projection boxes that contain objects that cast images on the walls of the studio’s back room. 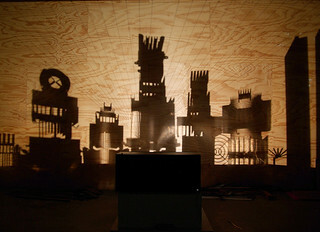 The results are visually complex cityscapes—large darkened outlines of high-rises and other familiar urban forms. While it is obvious this is a city, exactly what city this might be is less clear, as the architecture seems a cross between the futuristic and the familiar. It is no wonder that these forms are a bit enigmatic; they are created using capacitors and heat sinks pulled from common electronic devises—devices we interact with every day, but whose working components are far less familiar. Pinkusevich examines the role of architecture in our daily lives and how it frames, transects, and obscures the world around us, affecting our spatial perception and cognitive understanding. Her use of components from computers and televisions—technologies that also shape our perception of the world—is an apt metaphor. Her work also addresses broader issues related to global urbanization and labor. The fabrication of electronics and other consumer goods increasingly has societal and environmental consequences when formerly rural areas become sites of rapidly built factories and worker housing. The long-term impact this instant architecture will have is only beginning to be understood. Pinkusevich’s working process also provided a more direct connection to labor. She discovered that there was a specific order to disassembling the electronics and realized that she was actually reversing the process of the people who put these components together. Other sculptural works speak to this more personal view of labor and tie what is built to the anonymous builders, people whose labor—whether used for the construction of an apartment block or a pair of jeans—is increasingly taken for granted along with the resources used to fuel our disposable lifestyles. Born and raised in the Ukraine, Pinkusevich holds a BFA from Rutgers University and an MFA from Stanford University. She has been the recipient of a Headlands Center for the Arts Graduate Fellowship in Sausalito, a Cite Des Arts International Studio Residency in Paris, and a Helen Wurlitzer Foundation Residency Grant in Taos, New Mexico. She has exhibited primarily in San Francisco, New York and Santa Fe and her work is in the collection of Google, Inc. and the city of Albuquerque. For Modern Ruins (Popular Cannibals), Stephanie Syjuco takes beloved archetypes of modernist furniture and reproduces them dump-style to explore a range of ideas related to production, consumption, class, and economies. Continuing her investigation of copies and counterfeits, her George Nelson tables and Verner Panton lamps speak to how today’s reproductions are generations removed from their furniture forbearers. These iconic objects have been knocked-off or borrowed from so often that many people may think they originated at Ikea or Crate and Barrel. By exploring these forms, questions arise as to the original intent behind the designs and their meaning in today’s world where the clean lines of modern furniture often serve as signifiers of an affluent, idealized lifestyle. Using what she describes as a “shanty-like” aesthetic, Syjuco’s reproductions are certainly not meant to fool anyone or be functional. Instead, they bring the sleek, modern ideal into collision with the scavenged and cobbled-together through the immediate use of materials in rudimentary constructions. The works speak to the shoddy materials and cheap labor used to produce affordable contemporary modern furniture, and like the remnants of a dying civilization, suggest societal and environmental collapse. Calling on her own memories of the Philippines where International Style buildings stood alongside slums and shanties, Syjuco’s work also references Modernism’s long and complicated relationship to developing countries—how decades ago these new urban spaces adapted and formed their own versions of Modernist architecture which in many cases are now dilapidated signs of the promise of utopian progress. Syjuco is an assistant professor in Sculpture at the University of California at Berkeley. Her work is in the collections of the Whitney Museum of American Art, the San Francisco Museum of Modern Art, the New Museum in New York, and the Museum of Fine Arts Houston. She received an MFA from Stanford University and a BFA from the San Francisco Art Institute and has exhibited internationally including at venues in Paris, Manila, Berlin, and Bangkok. She is represented by Catharine Clark Gallery in San Francisco. During her residency, Brittany Watkins has collected objects such as window blinds, wire and inner tubes, and has shredded, knotted, woven and bent them to create abstract sculptural works. By dramatically altering their forms, Watkins has liberated these common items from their intended uses and explores their hidden potential. Watkins’ repetitive and time-intensive working process provides intimacy with the materials, and the resulting sculptures speak to connections between the inanimate and the animate. Suggestive of natural or biological forms, her works may also prompt viewers to assign more personal, human qualities to these objects. For her exhibition, Watkins will present a large-scale sculpture as the centerpiece of an installation that will include other smaller, related works. Designed to be entered, this central piece will enable viewers to step inside, be engulfed by the materials, and have the same sort of personal experience with them that the artist did when making the work. Those that enter will also be confronted with their own physicality within a space that itself references the body. The other small pieces that compose this sculptural ecosystem serve to illustrate the versatility and mutability of the materials. They are grounded, but also loop, drape, and expand out, adapting as required to unseen forces. 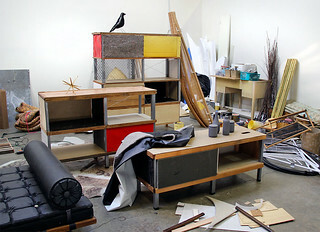 Watkins is a graduate student at the California College of the Arts. She received her BFA from Montana State University with an emphasis in sculpture. 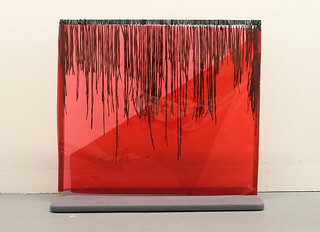 She has exhibited at the Center on Contemporary Art in Seattle, the International Sculpture Center Temporary Space in Chicago, and the IEI Austin Gallery in Texas. Her work was published in the October 2011 issue of International Sculpture.